Posted on Mon, Apr 1, 2013 : 5:59 a.m.
New experiences, a nightlife with endless options and a sea of potential jobs: Cities like New York, Chicago and Los Angeles can offer such things to an extreme that Michigan can't compete with. Claire Ewing didn't have a job when she moved to New York in July, months after her 2012 graduation from the University of Michigan. It would be half a year before she landed a public relations job for a popular fashion designer, but Ewing didn't mind the uncertainty. Chicago is home to one of the largest concentrations of U-M alumni in the world. Instead, she thrived on the adventure. "Most people just want the experience," explained the New Hampshire native, who said she'd rather be unemployed in a big city like New York than employed in Michigan. "I love Ann Arbor and Michigan, but I just love the metropolitan lifestyle. I thought that there were more opportunities here," she said. "Even if I could have found a job in Michigan, I thought that I could have found a job [in New York City] that I love even more." Ewing is far from alone. While a large number remain in state, many Michigan college graduates flock to big cities soon after they walk across the stage. Many have jobs, but some don't. Data box: Where are U-M alumni? Ewing said that among her friends in college, she can think of just a handful who stayed in state for a job rather than graduate school. Most went to New York or Chicago. 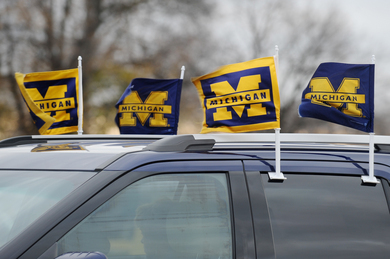 Of U-M's roughly 525,000 living alumni, 40 percent —or 211,000 graduates— live in state. Most are concentrated around greater Detroit (56,600), Northville (28,000), Flint (20,600) and Grand Rapids (9,400), according to figures provided by the U-M Alumni Association. The other 60 percent are concentrated in major cities. Of the 26,400 alumni that live in Illinois, 88 percent live in the greater Chicago area, according to alumni association figures. Of the 25,400 alumni that live in New York, more than half —13,200 graduates— live in or near New York City. Of the 41,000 alumni that reportedly live in California, half live in greater Los Angeles and San Francisco. "As someone in my twenties, living somewhere where there's lots of bars and nightlife and restaurants and shopping is really important to me," said 2012 U-M graduate Megan Duffey, who is working as an executive assistant for a job search firm in Chicago. Duffey, who hails from a Chicago suburb, said among the things that drew her to the city were family, ease of transportation, friends who had relocated to the area, the abundance of social actives and the prospect of jobs. "There's a lot more to do, a lot more options here in terms of social life," she said, comparing city life to her experience as an undergraduate in Ann Arbor. U-M and the alumni club don't track data historically, so there's no way of knowing if graduates are moving out of Michigan and into cities with increasing frequency. It's clear, however, that local business leaders are worried the state's brightest minds are leaving Michigan. At another recent forum, U-M President Mary Sue Coleman said many students leave the state and "do quite well" after gradating from the Ann Arbor college. At the same forum, Michigan State University President Lou Anna Simon said today's graduates are seeking "cool urban environments" where there are not only jobs, but there is plenty to do socially. "They will go there without a job in some cases," Simon said of Chicago. The two presidents emphasized the importance of Detroit's revitalization if graduates are going to remain in Michigan. This year 42.6 percent of U-M's 6,171 freshmen enrollees hail from outside of Michigan, marking a record number of out-of-state students entering the school. Many of those students return to their home states after graduating, as Duffey did. U-M also is one of the top educators of international students, which is reflected in the school's alumni base. In 2011, U-M had the eighth-largest body of foreign students among U.S. schools. "Michigan has become an increasingly international school," said Paras Parekh, director of marketing and membership for the alumni association. Though alumni are spread throughout all 50 states and most countries, Parekh said the school's largest and most active concentration of graduates live in state. Outside that base, Parekh said alumni residency follows the national trend of where college graduates are settling: near the coasts and in large cities. U-M's chief fundraiser, Jerry May, has emphasized that "wealth is on the coast" and said the school's next capital campaign, set to begin in the fall, will focus on recruiting donors from such areas. Tue, Apr 2, 2013 : 2:52 a.m.
U-M also is one of the top educators of international students, which is reflected in the school's alumni base. In 2011, U-M had the eighth-largest body of foreign students among U.S. schools. &quot;Michigan has become an increasingly international school,&quot; said Paras Parekh, director of marketing and membership for the alumni association. Every American university has become an international school. The Ivy league is practically an extension of the United Nations. That way after graduation they can compete for an American job (while the reverse isn't really possible). Kellie posted the alumni donor giving by state... but what is the giving by foreign alumni in general? Perhaps Mr. Parekh can supply that information. With an increasingly large percentage of UofM students being foreign this would be nice to know. Mon, Apr 1, 2013 : 9:04 p.m. So how do we get more Michigan grads to stay here in the State? Tue, Apr 2, 2013 : 1:33 a.m. Slash education and pass Bible Belt-style social legislation to make Michigan more like the states they're flocking to. Like Mississippi. Mon, Apr 1, 2013 : 11:26 p.m.
What makes you think we need them to? Mon, Apr 1, 2013 : 8:32 p.m.
Mon, Apr 1, 2013 : 8:28 p.m. It isn't just college graduates who are attracted to the big cities. A lot of youth are enthralled with the vibrant lifestyle of a New York. The cities are where &quot;it is at&quot; at least for this generation. I've never been to NYC (and I dearly want to go), but nothing beats Ann Arbor. Great small city full of life. Frankly, the big city is so passé. Try living in another country or living on the Great Plains. People who do that are being unique. Any place, no matter how drab it may seem, can be a place of emotional fulfillment if you choose it to be. Michigan is a beautiful state teeming with life and opportunity if you make an effort to find it. We so often think of the big city being &quot;the place to be&quot;, but maybe that ought to change. The Native Americans cherished and honored the natural beauty of this land for good reason. To paraphrase Michigan's motto &quot;If you seek a pleasant peninsula look around you.&quot; Beauty is all around you if you bother to look. It would be appropriate for Americans of this eco-conscious era to buck the trend and head for the wide open spaces instead of the densely-populated centers where so many already live. Mon, Apr 1, 2013 : 8:19 p.m.
Is the survey accounting for those that left to go to grad schools out of state vs for jobs out of state? Mon, Apr 1, 2013 : 7:47 p.m.
Won't the most populous states tend to have the highest percentage of every school's graduates, generally speaking? What would be more interesting is the per capita percentage of UM graduates in each state, and that trend line. Mon, Apr 1, 2013 : 7:46 p.m. I must admit, I was one of those U-M grads who dreamed of moving to a thriving, culturally rich city like Chicago or NYC. Yet at the same time - since my first jobs out of college were low-paying and NOT what I wanted to do for a career - I was terrified that I wouldn't be able to find work that would support me in an urban area, and that to really make a go of it, I'd have to ask for help from my parents, which I didn't think was right (especially since they had one more kid to put through college at the time). This, to me, points to the issue of socioeconomic class that may separate those who dream of making the move from those who actually do. Some young people may be able to coast with friends already settled in these cities until they can find their footing, but most, I would say, wouldn't have this option unless their parents are willing and able to foot the bill for a time. Mon, Apr 1, 2013 : 7:16 p.m.
Mon, Apr 1, 2013 : 6:36 p.m.
Mon, Apr 1, 2013 : 5:57 p.m. It would be interesting to see where the students who are moving to the big city are originally from. I didn't go to U of M, but when I was in college a couple years ago, most of the students who left the state were not Michigan natives to begin with. I will admit, Chicago was/is a popular destination, a big city, but close enough to go home, but most Michigan natives I knew who went out to the coast were in highly specialized fields like publishing and fashion, which pretty much only exist in big cities, and had rich enough parents to subsidize them. Mon, Apr 1, 2013 : 8:20 p.m.
our kids went to NYC - architect/art grad and an undergrad who chose to stay. No subsidy from us and they have struggled a bit. I asked during our last visit and both said returning to Detroit area was completely out of the question. Mon, Apr 1, 2013 : 5:15 p.m.
What these data don't track is movement out of the state of MI after a few years of getting a job. Perhaps the grads stick around a year or two after graduation for a small job to get started, but leave for greener pastures in a few years. This is the real migration and not tracked. Most international students leave after graduation because they have to. Their visas are up. Most are funded by their home country's government (which is why UM loves them, they pay full tuition and get no financial aid), so they have to return after graduation, it's part of the deal. Tue, Apr 2, 2013 : 3:38 a.m. They are allowed to compete for an American job (if they can't find one they have to go). I know of foreign students who have gotten American scholarships and worked during school. The tuition money foreign students bring in effect goes to the foreign academics who now make up a similar percentage of the school's makeup. So it is not the gravy train that people make it out to be for America. The Chinese government is the one paying for its nationals and is now stopping its tuition assistance I think. Mon, Apr 1, 2013 : 3:50 p.m. It is instructive to read the companion story today http://annarbor.com/business-review/the-top-10-job-opportunities-in-the-ann-arbor-area-through-2015/ listing top job opportunities in the area. It appears that of 10 top job categories needed, only about 3 really seem to need a college education. State government is mostly UM health and research, Financial sector could use some business graduates, and then there is computer design. Some of the others are skilled trades that would benefit from some college or specialized training, but not likely to appeal to UM graduates. I suspect that job availability may influence the decision to stay almost as much as night life. Mon, Apr 1, 2013 : 7:58 p.m.
Mon, Apr 1, 2013 : 3:10 p.m.
Four consecutive winters in Michigan would make anyone want to run screaming for California. Mon, Apr 1, 2013 : 7:43 p.m. I'd certainly rather live in a place with beautiful summers and not-so-pleasant winters than I would somewhere like TX or FL, where you can't step outside in the summer because of the oppressive heat and humidity. Mon, Apr 1, 2013 : 6:09 p.m. If that were the case, Chicago being as dense as it is with graduates wouldn't make any sense. Mon, Apr 1, 2013 : 4:44 p.m.
Mon, Apr 1, 2013 : 3:09 p.m. I am curious... how do these numbers for graduates staying in-state compare to other public universities, such as the top UC schools, the University of Virginia, the University of North Carolina, or more locally, the University of Wisconsin? What about when you take into consideration the number of students at those schools that are originally from those states? Mon, Apr 1, 2013 : 3 p.m.
Chicago appeals to me not at all and NYC does even less. Mon, Apr 1, 2013 : 7:25 p.m.
Yeah, I'm sure that if anyone doesn't find Chicago or NYC appealing, it must be because they prefer to cling to their guns and bibles and have antipathy for anyone who doesn't look like them. 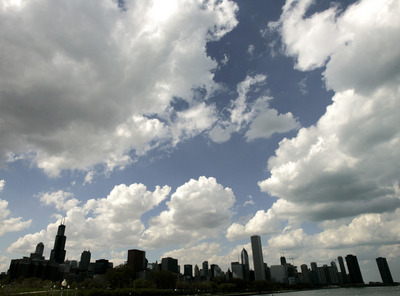 It probably doesn't have anything to do with those cities being very expensive and congested, or that the cities and their states are experiencing significant financial issues and exorbitant tax rates, or that Chicago has a very high crime rate and that the city and state are corrupt. Mon, Apr 1, 2013 : 4:21 p.m.
Perhaps you're just scared of being around different people and cultures. Mon, Apr 1, 2013 : 2:48 p.m.
discussions about demographics usually make me crazy because its data but without a purpose. So here are my questions: - Does Michigan produce a significant number of highly educated people (k-12+4 year college) who get their degrees and promptly leave the state? - Does Michigan produce a high enough volume of highly educated (k-12+4 year college) in-state people who stay in the state? if not, what part of the talent pool is lacking? - Do fresh graduates from other states (k-12 anywhere outside of Michigan and/or 4 years school out of state) come to Michigan? for those that do, why? separetly - of those coming to Michigan's true 4-year schools, how many are in-state. how many graduate? and where do they go post graduation. I think those data points will do it for part of the question but then you have to look at high level census data and bunch of other more ad-hoc tracking to get a sense if some are choosing to leave and possible some reasoning as to why. Mon, Apr 1, 2013 : 7:52 p.m.
right and that is cool and almost my question...one factor, educational level and private -v-public education, would get me to the answers I'm looking for. my guess, btw, is that highly &amp; privately educated Michiganders tend to leave more than others and more than in other states - and I bet we produce fewer 4 year college grads. AND i would also venture to guess that after almost a century of automomtive manufacturing and the lack of education that needs/has used etc,that our state culture is skewed toward lower education expectations and thus a tend toward the &quot;Sticky&quot;. but its just a guess, I'd love to see data. Mon, Apr 1, 2013 : 3:22 p.m.
Mon, Apr 1, 2013 : 1:34 p.m.
Out of curiosity, how can Northville, Michigan with a total US Census Bureau population of 5,964 (July 2011) have 23,000 Alumni? Mon, Apr 1, 2013 : 4:04 p.m.
Overachievers, or they are all very large! Mon, Apr 1, 2013 : 3:35 p.m.
Agree with the other commenters; would have saved plenty of trouble by just lumping the &quot;greater Northville&quot; category in with the metro area to which it belongs. Mon, Apr 1, 2013 : 3:17 p.m.
@Carrie Rheingans I would consider Northville and most of those other communities listed by Adam as 'greater' Detroit due to the fact they are, for the most part, all in the tri-county area. I'm guessing this is one of those situations where the group started in a small area and gradually expanded while keeping a singular name. Northville is milage wise in the center of those cities so it makes sense, but as we've learned today it can create a bit of confusion. Something like Western Metro-Detroit or something would be more clear. Mon, Apr 1, 2013 : 3:05 p.m.
i'm curious how far north,east,south,and west does the Greater Northville Area go?If you can include any area you want then you get any number you want which in turn tells you numbers don't really mean anything if u don't know what the writer was trying to prove. Mon, Apr 1, 2013 : 3:02 p.m.
Mon, Apr 1, 2013 : 3:01 p.m.
the numbers don't quite add up do they? Mon, Apr 1, 2013 : 2:55 p.m.
Also, is Northville not part of 'greater Detroit', while Ann Arbor appears to be (no specific breakout for just Ann Arbor)? Mon, Apr 1, 2013 : 2:01 p.m. This was my thought as well. I would think they would use Oakland County or something like that. Not a random town in the county....very odd. Mon, Apr 1, 2013 : 1:55 p.m.
Northville township and city combined has 30k-ish people so the math is still a bit odd, so they must be including neighboring cities &amp; townships like Novi, Plymouth, Canton, Livonia etc in that count. Sort of interesting that the U would just pick one specific city when referring to a fairly large area. Mon, Apr 1, 2013 : 1:45 p.m.
Also, there was an error in transcription. Greater Northville is home to 28,000 alumni, according to the alumni association. Mon, Apr 1, 2013 : 1:43 p.m. The area referred to is greater Northville. Mon, Apr 1, 2013 : 1:32 p.m.
Graduation from the University of Michigan guarantees a level of indoctrination worthy of draftees into a national socialism corps sent to all 57 states Obama campaigned in. Mon, Apr 1, 2013 : 4:16 p.m. Your comment has won my vote for the &quot;most ludicrous comment of the month&quot; award. Mon, Apr 1, 2013 : 2:12 p.m.
You're actually a bot, aren't you? Mon, Apr 1, 2013 : 1:10 p.m.
As pointed out last week by Mr. Grimes in the comments section, the US census counts international students entering school in the &quot;net international migration&quot; number, yet upon leaving school, they are counted in the &quot;net domestic migration&quot; number. So between the universities' rising enrollment numbers, the large numbers of out-of-state and international students coming and leaving, how do we get a clearer picture of the population trends of the non-student population within Washtenaw and Ann Arbor? Net domestic migration for Washtenaw has been negative for the last two years, while at the same time rising in all the other top growing MI counties. Is this the start or continuation of a longer term trend? For example, why did more people migrate to Livingston from Washtenaw, then the other way around? Filtering out the statistical noise created by the large, transient student population should hold some clues as to what is really happening with the actual long term resident population. Mon, Apr 1, 2013 : 4:36 p.m.
@Andy - I tend to agree with your hypothesis. I would add that the full economic impact of the financial crisis has not fully played out. Home prices in Ann Arbor were not hit as hard as the surrounding communities, so the affordability gap has only widened since the beginning of the crisis. Mon, Apr 1, 2013 : 3:40 p.m.
&quot;why did more people migrate to Livingston from Washtenaw, then the other way around?&quot; I agree this would make an interesting topic for a subsequent article. My hypothesis would be it's due to the relative affordability of new construction in Livingston as opposed to Washtenaw, which makes it more attractive to families with children. Washtenaw ends up with more childless households (with fewer people) who can better afford the higher costs of Ann Arbor real estate. Mon, Apr 1, 2013 : 12:59 p.m.
Who wants to live in Michissippi? Mon, Apr 1, 2013 : 6:03 p.m. Apparently only liberal Union supporters supporters with nothing better to do than complain about slick Rick and right to work. Mon, Apr 1, 2013 : 12:32 p.m.
A nice &quot;alumni report&quot; - Now some further breakdowns that might be of interest - (1) Of the graduates in the last 10 years who are employed - where do they live? (2) of all graduates who are employed - where do they live? (3) of employed foreign graduates in the last 10 years - where do they live? Mon, Apr 1, 2013 : 12:54 p.m. I'm an '09 grad who was from West Bloomfield when I attended UM. I now live in Troy because I found a FT job here ... would have loved to have moved to Boston or Chicago but it wasn't to be. Mon, Apr 1, 2013 : 12:13 p.m. I'd be happy never to see that word &quot;talent&quot; used again to refer to graduates. Do we know whether all of those who left the state are &quot;talent&quot;? Is &quot;talent&quot; major-specific, so may English lit majors leave the state without raising alarms? Or is &quot;talent&quot; merely an age marker, i.e. 21-23 = talent? (English lit majors - I think you have real value as educated citizens and possible future Pulitzer prize winners; this is just an example.) Another grumpy comment: the story refers to an Ann Arbor college. Could it possibly be referring to the UM? There are, of course, another couple of colleges, including Concordia. Mon, Apr 1, 2013 : 12:06 p.m. These numbers are actually quite good. About 65% of the U's undergrads are from in State. Few of the out of state students are staying here, so nearly 2/3's of the in State students have stayed in the state over the long haul. Would be great to have it be higher, but with a world class University, you're going to have demand for these graduates everywhere. Mon, Apr 1, 2013 : 12:01 p.m.
My main goal when I graduated from the U was to find a job on the coast. I was lucky enough to have a choice between California and New York, and chose the latter. Those were some of the best 8 years of my life. Mon, Apr 1, 2013 : 11:38 a.m.
Why would they stay here when most of them didn't come from here in the first place? They come from all over the country, and the world to get an education, not to live here forever. And, if they did, where would they find work? A U of M education can take them almost anywhere they want to go - that was their original purpose in coming to Ann Arbor. It should be our pride that we can provide that jump start for the rest of their lives wherever they go. Mon, Apr 1, 2013 : 4:55 p.m. This is a really important point, and I'm glad it leads the comments. So many of them aren't from Michigan in the first place. Mon, Apr 1, 2013 : 11:49 a.m. I agree with you: It's hard to get people who aren't even from Michigan to stay in Michigan once they graduate. That was the case with a lot of my friends. I wonder what companies/job recruiters would need to do to convince people to stay. Higher pay?